Rilla Go Rilla is a Dutch based brand founded in 2015. A platform for designers to create beautiful new products in collaborations. And in 2017, they created their very own first collection of wonderful backpacks for kids - Miss Rilla. Cool Circus Tent Backpack in sage green from new brand Miss Rilla. The bag has adjustable padded handles, waterproof bright neon pink zipper, an inside zipper pocket and elastics on both sides for bottles. Every backpack comes with a special matching keychain. 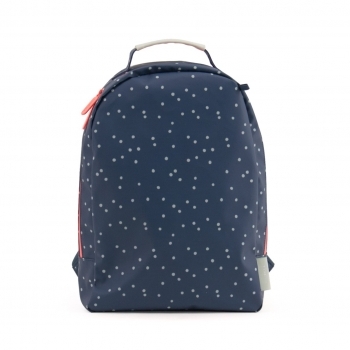 Cool Dots Backpack in midnight blue from new brand Miss Rilla. The bag has adjustable padded handles, waterproof bright neon pink zipper, an inside zipper pocket and elastics on both sides for bottles. Every backpack comes with a special matching keychain. Love is in the air ! 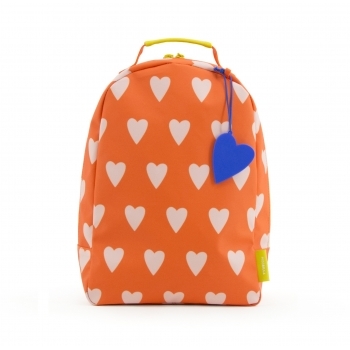 This cute Miss Rilla Heart backpack from Rilla Go Rilla is perfect for little love-addicted girls. It has adjustable padded handles, waterproof zippers, an inside zipper pocket and elastif for bottles. The cool thing about it, the bag is made from recycled PET bottles. Cool soft pink Backpack from the new brand Miss Rilla. The bag has adjustable padded handles, waterproof bright neon pink zipper, an inside zipper pocket and elastics on both sides for bottles. Every backpack comes with a special matching keychain.